A step by step video of how to make Kolaches, a Czechoslovakian pastry. 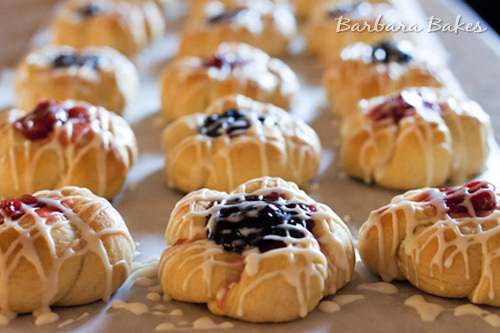 Similar to a Danish, Kolaches have a dollop of fruit filling in the middle, but with a softer, fluffier, more roll like dough. Every year for Christmas I make my family Kolaches. This year I was invited to make them as part of the Holiday Hangout videos on Google+. This is the first video I’ve done for my blog. The video quality isn’t great – I blame my cheap laptop for that, but it was a lot of fun. Thank you to the lovely ladies who joined me. Here’s the schedule if you want to check out the other fantastic Google #holidayhangouts. I hope I inspired you to give Kolaches a try. They are a perfect way to start the day Christmas morning. That was so fun to see you in action! You’re a natural! These little pastries sound/look insanely GOOD! Merry Christmas! I love kolaches. They are delicious! Thank you for sharing the video. I’ve never heard of these, they look marvellous. I will leave you on screen and watch this video as soon as I’ve picked Ted up from school. Excellent video, it is always fun to put a face/voice to my blogging friends. Merry Christmas!!! Great video, Barbara! I’d be shaking in my shoes but you were cool as can be 🙂 Great recipe too. You should be the next Food Network star! Great start on your video career. You’re too sweet. Thanks for watching. We have a Kolache bakery down the street and they make the BEST breakfast treats. A few years ago she published her recipe in the town paper. I’ve been meaning to try them. thanks so much for the link!! And I can’t wait to watch the video all the way through!! How fun! A softer, fluffier, more roll like dough with jelly (and I already love Danish rolls) sounds about perfect to me! A delightful pastry! Lovely video.